I’ve been getting a lot of questions lately about when and how to hire help for your blog (also called outsourcing). 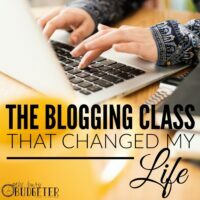 If you took Elite Blog Academy in February, you’re likely getting to the point where you’re starting to look into hiring help to grow your blog. My personal opinion is that outsourcing is the greatest thing ever. But it’s really scary to commit yourself to paying someone else to help you and even then it’s hard to find good help. So, I thought I’d run over how I’ve done it. Know exactly how hiring help will make me more money. Can afford to hire in the leanest business budget (you may not immediately see a jump in income). Have calculated my hourly rate (how much you make divided by how many hours you work in a month) and can find someone to do it cheaper, faster and better. i.e. If I make $99/hour on average and can hire someone to do something for $25/hour than that’s a good move. With all that being said, it’s important to know what you can’t outsource. What makes your business you? What are you the absolute best at? For instance, I’m a blogger. I’ll always be writing posts and writing newsletters. This is what I love and what I’m good at. You’d be pretty ticked if someone else was writing newsletters to you pretending to be me (and everyone’s “voice” is unique so it would be easy to tell). But do you care if my VA schedules my emails to go out after I’ve written it? Takes care of formatting, spell checking, linking etc? But it turns out that editing and scheduling take me almost as long as it does to write! I’m terrible at it and I dread doing it. If I had that time back, then I could apply that time to writing more, working on updating old posts with affiliate info and creating my own products. That little tiny switch means more money, more time, and a MUCH happier work day. 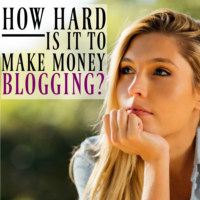 Yes, I only work 20 hours a week blogging and I make a full time income. But I spend those hours doing ONLY the things that no one else can do for me. The second that I’m able to have those 3 criteria met, I outsource immediately. And every time it’s worked out for the better. How do you tell what you need to be doing? Make a list of every single thing you do in a month for your blog. Editing, scheduling, making graphics, mastermind groups, talking to sponsors, training, updating plug ins, etc. Efficiency (where I take a look at my current systems and figure out how to make them better. I’m implementing Scrum right now). Graphic Design (for Pinterest only). Launch Planning and execution (using The Core Affiliate Strategy). Newsletters for budgeting list (want to join? You can get on the budgeting list here). Newsletter for blogging list (want to join? 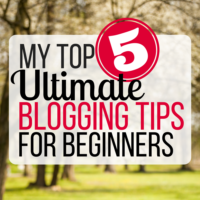 You can get on the blogging list here). Email growth (creating free programs like the 90 Day Budget Bootcamp). Product creation (like The Pinterest Strategy Guide and The Core Affiliate Strategy). Master task list (the little things you want to do like update your about page, or change your categories). Keep in mind that I was already heavily outsourcing when I created this list, so you will likely have more tasks on your agenda. Which things are you the absolute best at and which things do you love doing. Keep those. Everything else, try to brainstorm ways to outsource them. Where do you hire help? I’ve done this two ways. For skills that are common to find in a Virtual Assistant (like social media scheduling and food photography), I release a job notice with all the details and what exactly I’m looking for. I just spell out what I’m looking for in plain English, the same way I would write to a friend. I have them send samples of their work and their references. I talk with them and discuss the job in detail. For the positions that I’ve hired so far, I was looking for someone willing to learn the way that I’ve done it (since they’re just replacing me doing it) and I always seek someone that has a personality that I work well with. If you wouldn’t want to hang with them in real life, you likely won’t want to work with them. Be willing to take the time to train them and to follow up with them until they’ve got it right and be available for guidance if needed. I’m not sure the official answer on this, but I’ve done it successfully. The key is that you need to feel comfortable telling the person what they’re doing wrong and how to fix it. No matter how close you are, you need to be willing to pull rank and to make sure that the person is guiding your business in the direction you want it to go. And if you do go that route, make sure that they feel the same way and understand that you both separate work from your friendship. VA Groups on Facebook (this is my favorite). Readers (I know tons of bloggers who found awesome hires in their readers!). EA Help (I haven't used them yet but I’ve heard good things). Tech guy (I never know what to call him. Grayson handles EVERYTHING tech related for me and teaches me what I need to know). Social Media (Mostly Facebook and Twitter). Child care (to watch the littles while I work – I could swing this without help, but my husband's opening a brewery which means he’s busier than I am and this makes me a calmer, saner person). Fun fact: Brewery businesses are WAY more hassle than a blog business! VA expanded to handle scheduling, calendars, sponsored outreach, coordinating. contractors, anything and everything that isn’t writing posts, emails, and pin graphic design. Formatter (helps VA with editing and formatting). The golden rule of hiring help for your blog. I’m a huge fan of employees being invested in the success of the business. Two years ago, The Busy Budgeter was mine. It was my blood, sweat, and tears that created it. But now it’s ours. I love this blog because it gave me the freedom to live the life I always wanted. A reduced full-time work schedule and being able to stay home with my family (for the most part). My goal in hiring is to give that freedom to others. And I feel so lucky to be in a position to do that. I’m a fan of treating your team like the valuable and respected assets that they are. 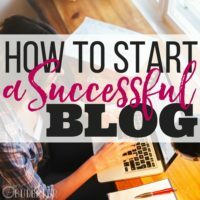 Create an environment that they thrive in, have their efforts tied closely to the success of your blog, show them the results of their effort, and be transparent with them. There’s room for everyone to shine. 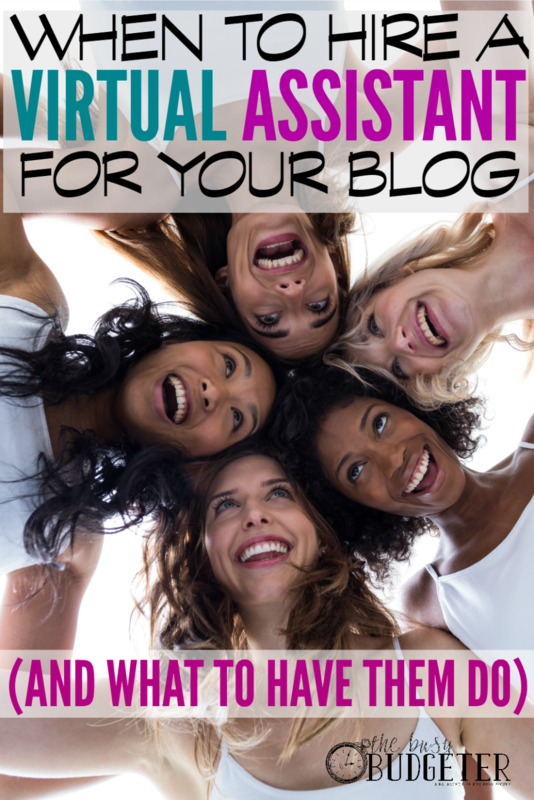 What tasks do you outsource on your blog? I’ve recently hired help and it has been AMAZING! It’s like magic asking my VAs to do a task for me. It has also exposed some really bad habits I have in terms of procrastinating. I’m hoping to bedtime even more intentional and productive with new help. I was wondering exactly when to know it’s the right time. This makes perfect sense. Thanks for sharing how you do it! Thank you for this post. It’s really timely for me, I’ve been trying to figure out what and how I can outsource. There are just some things that take me really long to do!